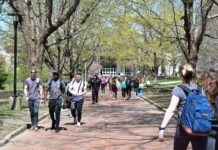 The University of Rhode Island Disability Services for Students office and its Department of Housing and Residential Life work together to provide additional options for students with disabilities who are living on campus. Students who have documented disabilities, such as anxiety, that require an emotional support animal now have the option to have a pet that is not a fish while living on the URI campus. Though qualifying for this option is not easy, some students can. It is unlikely that students will receive special housing accommodations for food allergies that they have, but they can get other services related to their allergy through dining services. 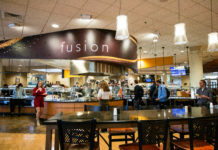 Students can work with two registered dietitians, as provided by Dining Services, to help them find foods that fit their needs or get meals specifically tailored for them. Even if a student would like a gluten-free meal simply for health reasons, Dining Services will assist them in the process. But without the documentation of an unusual or extreme case, which shows that the student’s request is necessary, students are expected to live in the dorms without special treatment in the housing process. Whether or not a student is given special accommodations by the university is dependent on the documentation of each student’s disability and what their symptoms are – whether physical or mental. Disability Services then works to make a judgement about whether housing or other aspects of university life need to be altered to fit a student’s needs and/or requests. As for students with learning disabilities, such as ADHD, their problems are more centered around academic life. But students are still encouraged to follow the procedures and give proper documentation to disability services, as they look at each student individually. Students who file a request with Disability Services about their current or future housing must also participate in the regular housing application along with the rest of the university. Disability Services will then figure out how they can or should help each student and pass this information along to housing. “We don’t do any blanket statements concerning a disability, it’s all case by case,” emphasized Rohland.